This is a quality British-made product to the same specification that you get on golf courses. The backsaver design is perfect for removing balls from the cup with the minimum amount of effort. Comes complete with tubed flags which swivel in the wind. Perfect for practice greens at golf clubs or in your home garden. Perfect gift for the avid golfer. 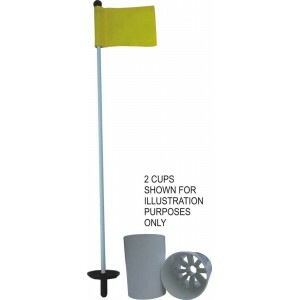 The hole cups are British-made using high quality Nylon plastic and are used on golf courses up and down the country.